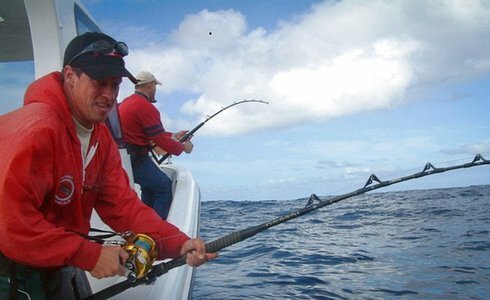 Get hooked on some of the finest Big Game Fishing in the world with a thrilling Cape Town Deep Sea Fishing Tour. The predominant offshore target species include Yellowfin tuna - one of the world's toughest fighting fish. Experience the warm Agulhas current of the Indian Ocean and the cold Benguela current of the Atlantic Ocean on a thrilling deep sea fishing tour, providing an exciting trip to Cape Town. Offering some of the richest deep sea fishing grounds in the world, Cape Town's waters are teeming with life and are home to a number of different cetaceans such as common dolphins, dusky dolphins, Southern Right whales, Humpback whales, Bryde's whales and Orcas. On your Cape Town deep sea fishing tour you may also encounter Cape Fur seals as well as coastal and pelagic seabirds. 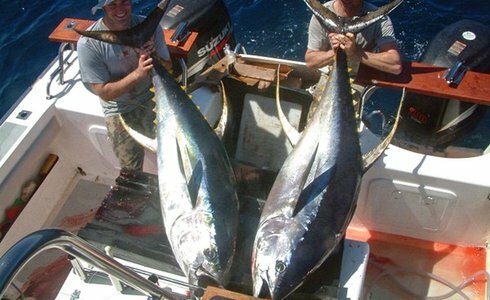 Deep sea fishing can be enjoyed all year round in Cape Town. Predominant offshore target species include Yellowfin tuna - one of the world's toughest fighting fish, Longfin tuna - a smaller member of its family, and very often Skipjack, Katonkel, Dorado and Cape Snoek may be hooked. Game shark such as the Mako and Blue shark ensure a great fishing experience, but are caught on a strict catch and release policy. Please note: Boats can accommodate up to 8 persons (please enquire for exact rates and seasons for species available).